A small group of the Hv scientists at the Proton Channels table during the meet-the-speakers session on the final afternoon of the conference. From left to right: yours truly, Boris Musset, Vladimir Cherny, Deri Morgan, Melania Capasso and Susan E. Smith. Picture taken by Tomas DeCoursey. 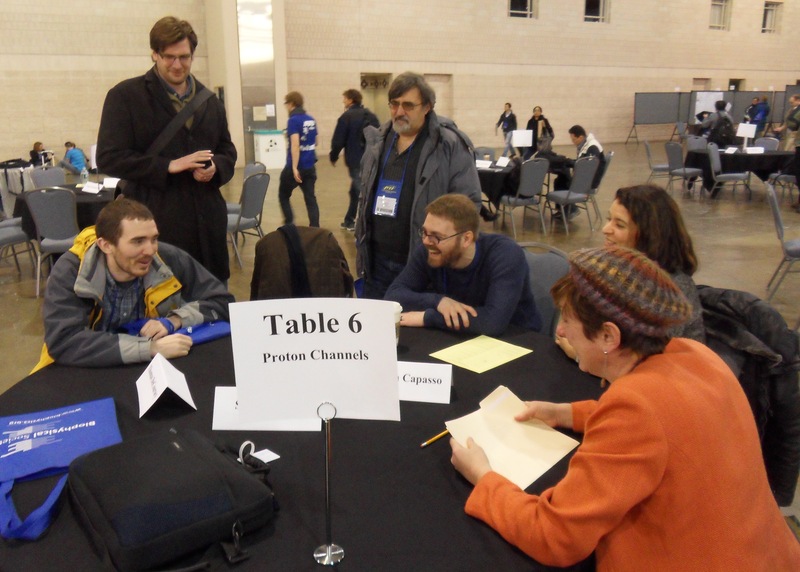 This year was a big year for Hv at the Biophysical Society meeting in Philidephia (Feb. 2-6th). With a symposium and a platform session dedicated to Hv related talks, the meeting boasted a large contingent of scientists studying this channel. I was in attendance and really enjoyed meeting all my fellow Hv researchers whose work I have thoroughly read and admired. Lots of very interesting work was presented in the talks and posters, but since a lot of the data present is unpublished I will not be discussing it in detail here. However, a couple interesting themes did emerge from the conference that I thought I would elaborate on. The week before the conference, two very interesting Hv papers came out in Neuron (Qui et al. 2013 and Hong et al. 2013). Using voltage-clamp fluorometry, Qui et al. show that the gating of Hv channels occurs via two distinct conformational changes: one that precedes channel opening and is interpreted as S4 moving; and one that is concomitant with channel opening. They then measured the voltage-dependence of these two conformational changes and built a very interesting model of channel activation that involves strong cooperativity between channel subunits only during the second channel opening conformational change. I will not discuss this model in more detail here, as I will save it for a future blog post. On the other hand, Hong et al. describe a group of small molecules that share structural homology with arginine side-chains that constitute a new class of Hv channel inhibitors. They define the likely binding site for these blockers to be within the transmembrane domain of the Hv channel near phenylalanine 150 at the proposed charge transfer center. Since Hong et al. demonstrate that these molecules only bind to the open channel, occlude the proton conduction pathway and can be “pushed-out” (competed off) by inward H+ current, the molecules are classified as open-pore blockers, similar in mechanism to cationic blockers of K+ channels (ie spermine in Kir channels). These small molecules represent a new and powerful tool for Hv researchers and may even have important therapeutic potential. It was a great pleasure to hear talks from both groups in Philadelphia and to have the chance to meet the researchers and discuss their work further. What’s up with the N-terminus? At the conference it was evident that data from many different sources are coming together to indicate an important role for human Hv1’s N-terminus. As most of this data is unpublished I won’t discuss it in detail here. Instead, I will elaborate on a hypothesis that Rod put forward during his talk: that the N-terminus binds to the transmembrane domain of the channel and stabilizes the hyperpolarized (closed) conformation. The best data supporting the idea that contact exists between the N-terminus and the transmembrane domain of human Hv1 was provided by the work of Musset et al. (pictured above), in which they showed that a phosphorylation site at amino acid residue Threonine 29 (Thr29) on the N-terminus has a significant impact on the channel gating (Musset et al. 2010; see my post Human Hv1: Architectual Overview to learn more). Specifically, they showed that, upon phosphorylation of Thr29, the opening of the channel becomes left-shifted, i.e. that smaller depolarizations are needed in order to open the channel. This could arise by the phosphorylation Thr29 doing one of two things: destabilizing the hyperpolarized conformation or stabilizing the depolarized (open) conformation, either of which would make the channel easier to open. Setting aside for a moment the mechanism of how the phosphorylation of Thr29 affects the gating, the fact that it does strongly suggests that this residue, which is distant from the transmembrane domain of the channel in primary sequence, must nonetheless interact with the transmembrane domain in order to modulate the gating. With support from some unpublished data he presented at the meeting, Rod proposed that the unphosphorylated N-terminus may bind to the transmembrane domain and stabilize the hyperpolarized conformation. If true, this would mean that, if phosphorylation of Thr29 disrupts the interaction between the N-terminus and the transmembrane domain, the hyperpolarized conformation would be destabilized, resulting in a left-shift in the voltage activation of the channel. Disruption of protein-protein interactions by phosphorylation is a common theme in physiology and it may be phosphorylation of Thr29 is doing something along those lines. In light of this new hypothesis, it is interesting to speculate on other physiological features of the channel that may be regulated by interaction between the N-terminus and transmembrane domain. We know that the channel is highly regulated by the pH gradient across the cell membrane, such that, the channel only opens when the electrochemical gradient for H+ would result in outward current. This is why, in humans, the Hv channels’ main physiological roles always involve acid extrusion. The mechanism that was proposed for this regulation was that the channel contains two “pH-sensors” one on the extracellular side and one on the intracellular side (Cherney et al. 1995). When protonated, the extracellular pH-sensor stabilizes the hyperpolarized conformation, whereas, the protonated intracellular pH-sensor stabilizes the depolarized conformation. The model also predicts that the extracellular site can only be protonated in the hyperpolarized conformation and the intracellular site can only in the depolarized conformation. There is some evidence that the external site may be the same site as the Zn2+ binding site, defined by residues His140 and His193 (Cherney et al. 1999; Ramsey et al. 2006). The identity of the internal site has never been found. If the hypothesis Rod presented is correct, it may be that the internal site is not located on the transmembrane domain but on the N-terminus. If interaction between the transmembrane domain and the N-terminus regulates gating by stabilizing the hyperpolarized conformation, disruption of this interaction by protonation of key residues on the N-terminus would promote channel opening. With most of the mutagenesis of the channel being focused on the transmembrane domain, residues on the N-terminus that are potentially important for channel regulation have not thus far been identified. Another major topic of discussion at the meeting was the use of S4 alignments to generate homology models of Hv channels based on the structures of other voltage-sensor domains. As avid readers of this blog may recall, I weighed in on this topic last summer in a series of posts (The Problem of aligning S4, Is the S4 helix of Hv short? and Biochemical Data Constraining the S4 of Hv). In my final entry in this series, I examined published biochemical data to see if any of the alignments used in the published homology models could be excluded. It was my great pleasure to learn about the very interesting evolutionary analysis by Susan Smith (pictured above) and how, using such a different method, she reached similar conclusions to my own. Hopefully, future homology models based on these new alignments will bring a more accurate picture of Hv channels. Better still, hopefully we will soon have an experimentally determined structure. Since the identification of the voltage-gated proton channel gene in 2006, the study of Hv channels has greatly expanded. It seems that every few months now, a new and important physiological role of the channel is discovered. I try to highlight some of this physiology on my blog but it is difficult to keep up. At the conference, two talks featured new work on Hv physiology highlighting the channels role in human B-cells and in dinoflagellates. Melania Capasso (pictured above and in the featured image) presented her work how Hv channels regulate B-cell receptor signaling by modulating the levels of reactive-oxygen-species inside the cells (Capasso et al. 2010). In addition, she showed that some leukemias and lymphomas over-express Hv channels and that the channel may play a role in the cancer’s biology. Tom DeCoursey (pictured in the featured image) presented the role for Hv channels in generating the phosphorescence of the single-celled dinoflagellate plankton that can be seen glowing in the ocean at night. The dinoflagellate proton channels have many very interesting unique physiological features that make them well adapted to perform this role (Smith et al. 2011). These two very different physiological functions highlight the diversity of roles that nature has found for this channel. Proton homeostasis is important for all organisms and all cells. It seems that Hv channels are a tool that life uses again and again to maintain the necessary proton balance. Many Hv scientists at the conference were expecting Rod to reveal the structure of the Hv channel during his talk at the Hv session. Unfortunately, although we are close to an NMR structure of the channel, we did not have it completed for this meeting. Nonetheless, the most meaningful thing I took away from the conference is the great anticipation and excitement that my colleagues in the Hv field have for our work on the structure. With a little luck we will have the structure soon and hopefully it will provide a useful guide for designing experiments to answer some of the fundamental mechanistic questions surrounding Hv channels and voltage-sensing in general. In closing, I would like to thank everyone I spoke to at the conference who showed gratitude and appreciation for my work on this blog. I am glad that my writing on these subjects has been so well received and I hope to continue posting quality articles that the biophysics community will enjoy. One of my main reasons for writing this blog is to foster discussion between scientists in this exciting field, so please leave comments, ask questions and contribute to the discussion. Thanks again. Cherny, V. V., & DeCoursey, T. E. (1999). pH-dependent inhibition of voltage-gated H+ currents in rat alveolar epithelial cells by Zn2+ and other divalent cations. The Journal of General Physiology. Cherny, V. V., MARKIN, V., & DeCoursey, T. E. (1995). The Voltage-Activated Hydrogen-Ion Conductance in Rat Alveolar Epithelial-Cells Is Determined by the Ph Gradient. Journal of General Physiology, 105(6), 861–896.